One of the challenges of taking Cameron to school is having to drive past the State Arboretum of Virginia on my way back home. Even though I had a pressing deadline today, I just had to stop in since the Ginkgo Grove is at peak and thus far I haven’t had much luck. Cam and I visited Friday evening on the way home from school, but a bank of clouds on the horizon left me with flat light in the grove, although it made for lovely sunset images. This morning Peppermint and I took a walk to the grove, and the light was beautiful. We meandered among the Ginkgos, taking in the unique scent and getting our feet wet in the dewy grass. It’s quite an amazing sight to see 300+ Ginkgo trees all in one place, bright yellow and brilliant on a gorgeous fall day…definitely worth a little guilt this morning! Tricia, this is a beautiful photo! I LOVE Gingko trees. There are two on the Leesburg courthouse grounds. I didn’t realize there was a grove of them at the Arboretum. Will have to make a trip to see them. Thanks for sharing! Thanks for visiting, Terri! Definitely worth the trip out to the Arboretum to see the Ginkgos. This year, in particular, they are stunning to see at peak color. 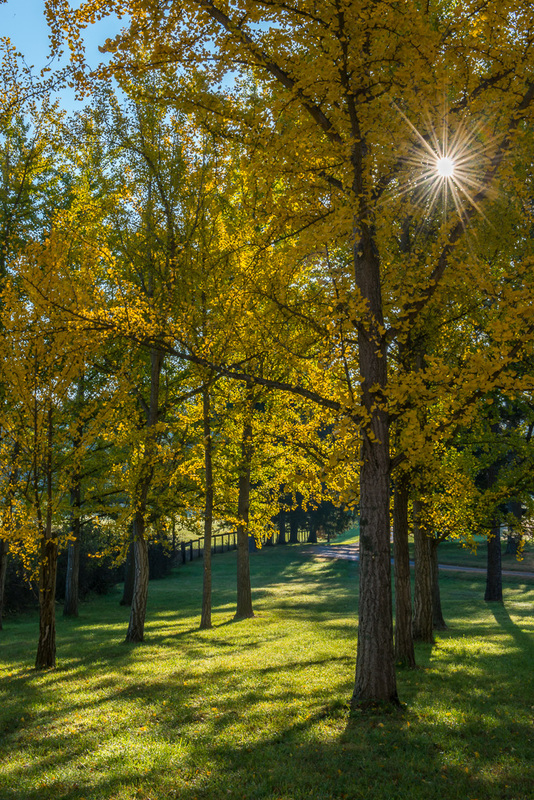 Gorgeous picture and definitely a distinctive smell when you are around Ginkgos. It makes me wonder what wildlife the fruit appeals to??? I’m not sure there is a species here that eats the fruit because it’s all over the ground rotting. Come to think of it, I’ve not even noticed many insects around in the grove. Interesting. Tricia this is fabulous! I love the light and the star effect of the sun. It must be some sight to see 300 of these tree al dressed in their fall glory!!! Yes, I think I’ve been going here for three years to photograph the trees and this is the best year yet for colors. It also helps that we’ve had a lovely week of fall weather, and the leaves haven’t been blown off in a storm. I have to say this is one of our best fall seasons in ages for photography!